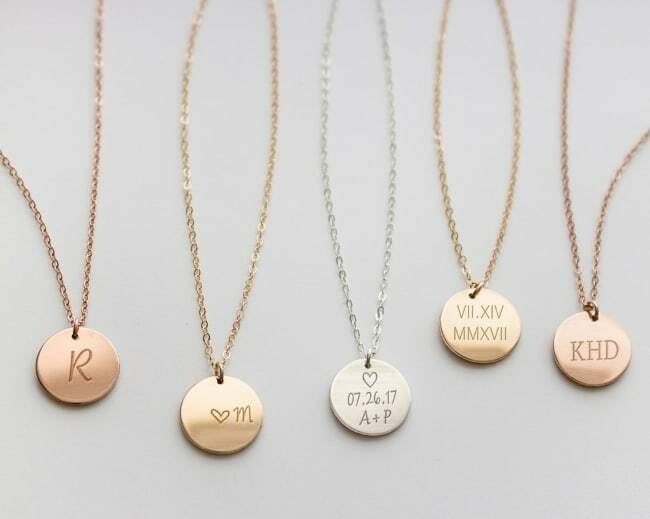 When it comes to bridesmaids gifts (or even wedding favors for that matter) brides and grooms tend to choose items that have their own wedding date or initials engraved. I never fully understood this practice. 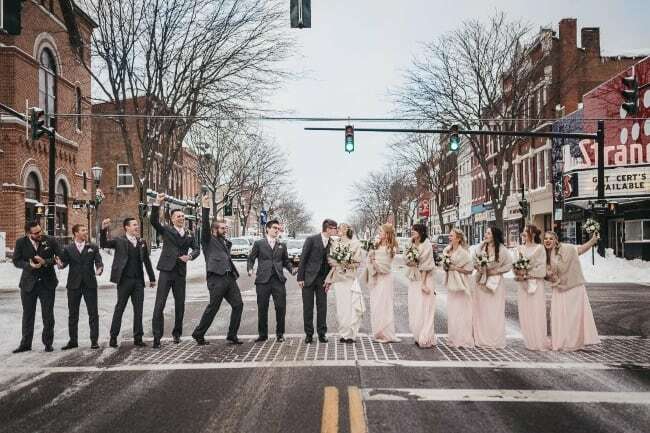 I get that it is exciting to share your wedding date with all your friends and family. However, after the wedding is over who really needs a drink koozie with your wedding date? With that in mind, I’ve put together a list of best bridesmaid gift ideas for under $65. To all my wedding couples out there: these are gifts that can and will be used for a long time after the wedding date. Gifts that the receiver will look at fondly and reminisce over the wonderful time they had at your wedding. 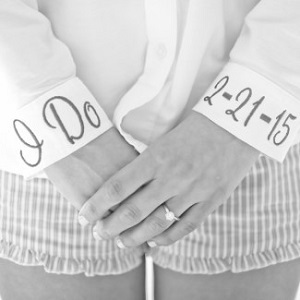 Gifts sans the tacky wedding date or initials! 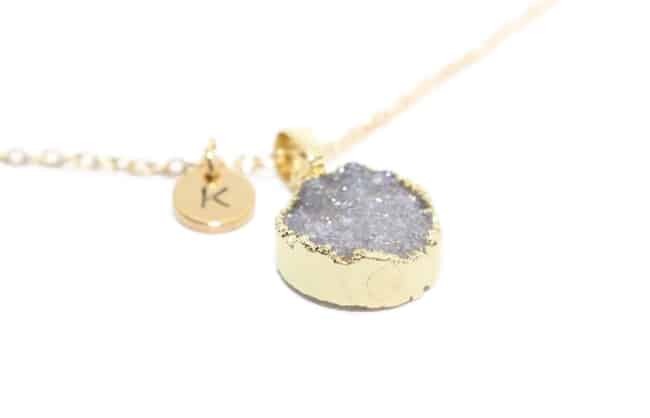 If you know your bridesmaids are the types to appreciate a little bling, add some sparkle to their initials with a druzy design. Let your bridesmaids shine on all day (and night) with a personlized necklace that will glitter and shimmer with every spin on the dance floor. 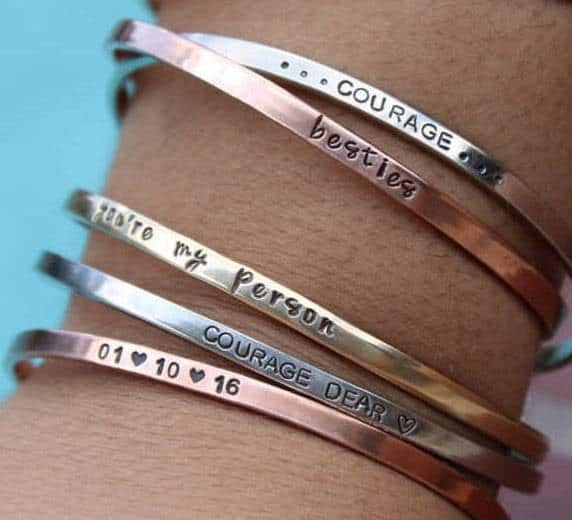 These slim, stackable bracelets are a brilliant way to show how much you appreciate your besties. Pick the quotes or phrases that mean the most to you. 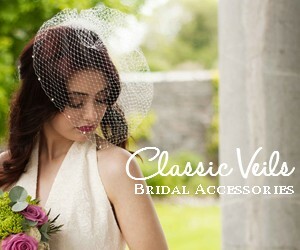 Mix and match so that all of your bridesmaids get just the right combination to suit their special role in your life! 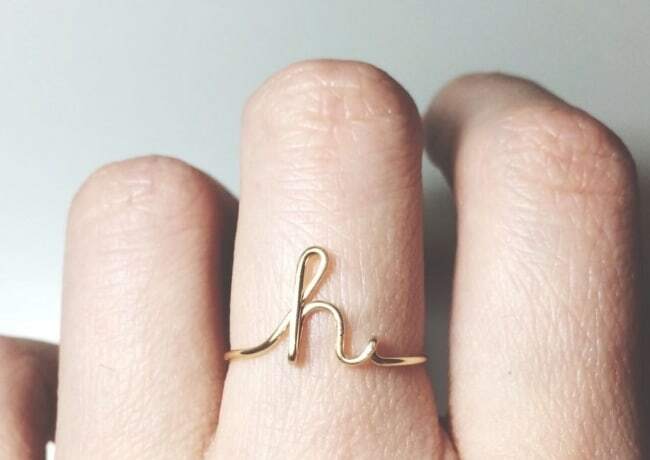 Sweet and discreet, a custom initial ring is as perfect a wedding day treat as it is for everyday wear. 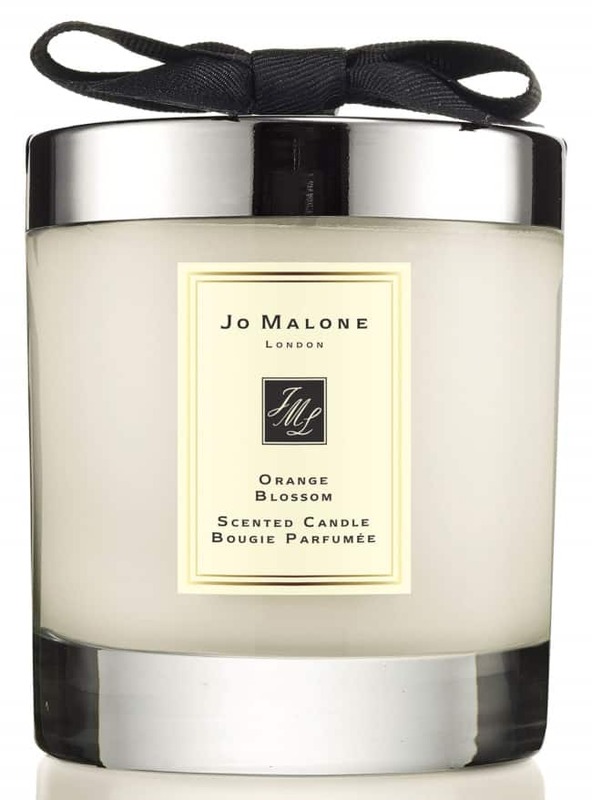 Your bridesmaids will rock a gift like this to the office as well as on nights out. 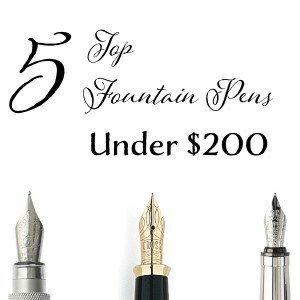 Plus, they’re sure to love a gift that’s so personalized and flexible. For something a little more traditional, why not indulge a love of sparkles with a pair of crystal cluster earrings? They’ll pair well with bridesmaid dresses in all sorts of styles, and will be a firm favourite for years to come. Mix things up a little. Instead of giving your favourite girls a piece of jewlery, give them a special place to store all the rings they already own and love. These classy dishes are great for keeping precious bits and pieces safe. 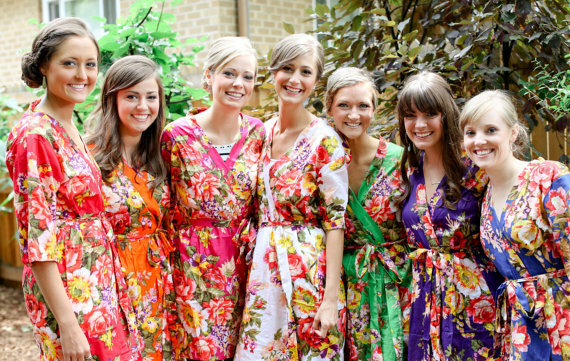 A fun photo I see from real weddings all the time is the bride and her bridesmaids each wearing matching fabulous floral print silk robes while they get ready on the morning of the wedding day. Look cute in matching silk robes as the champagne cork pops, hair spraying begins, and your girlies get all dolled up! For an understated, chilled out vibe on the big day, you could swap in these delightful cotton robes. The colors are simple and tasteful and the lace detailing really makes them pop. Slip into cotton robes while you’re all getting ready together and make sure you’re ready for a super stylish photo shoot. 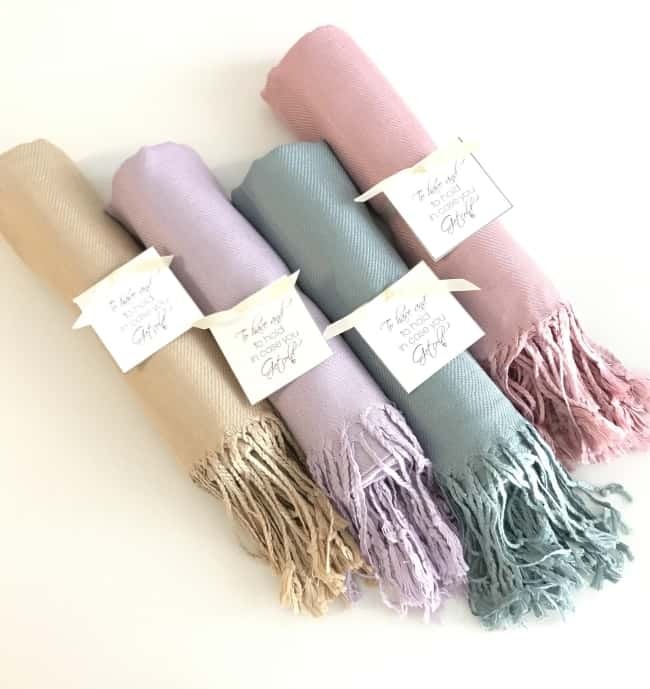 You can’t go wrong with giving your fashionista girls a beautiful pashmina for spring and summer weddings, especially if you’re planning an outdoor ceremony. A pashmina is a fab way to cover up through wind or shine. 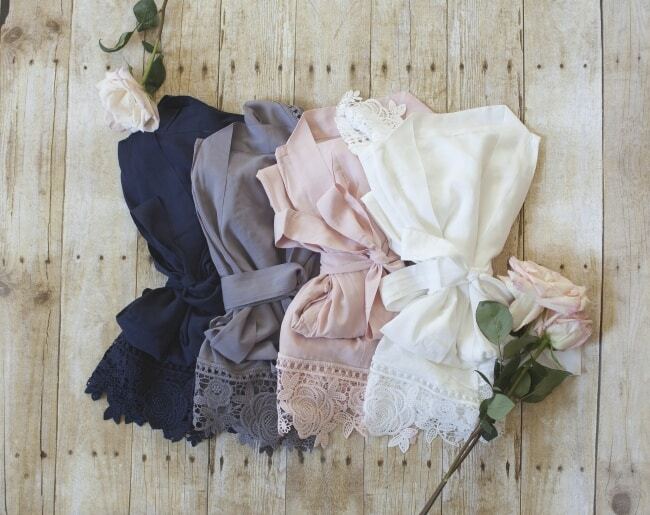 Once the sun goes down, your lovely bridesmaids will have a soft shawl to keep them warm until they hit the dance floor. On the flip side, if you are having a winter wedding you’ll want a way to keep your girls nice and cosy all day long. Gift them a beautiful faux fur wrap that will leave them feeling snug and oh-so-glam, no matter how chilly it is outside! How stunning are these vintage clutches? Each bridesmaid could have a unique pattern of her own while still coordinating with an overall color palette. Perfect for the day of as well as long after the wedding. Your best girls are sure to look killer in a pair of heels, but they’re also guaranteed to be on their feet 24/7 on your big day. 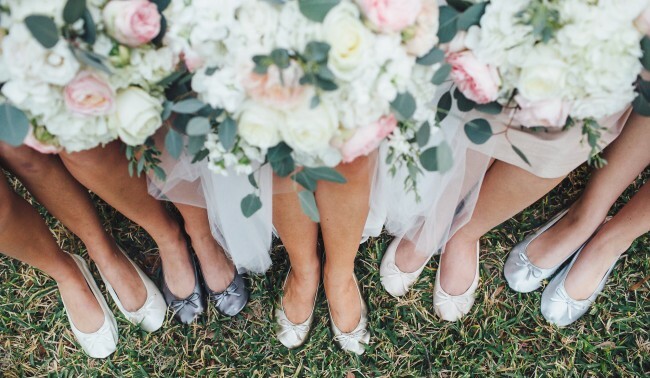 Give their toes a rest with some matching bridesmaids flats that will complement your outfits to perfection. These are so pretty, you’ll probably find your friends dancing round their living rooms in them long after the weeding. Special dresses or outfits deserve a special hanger, and these lovely designs mean you can personalize everybody’s dressing spot. 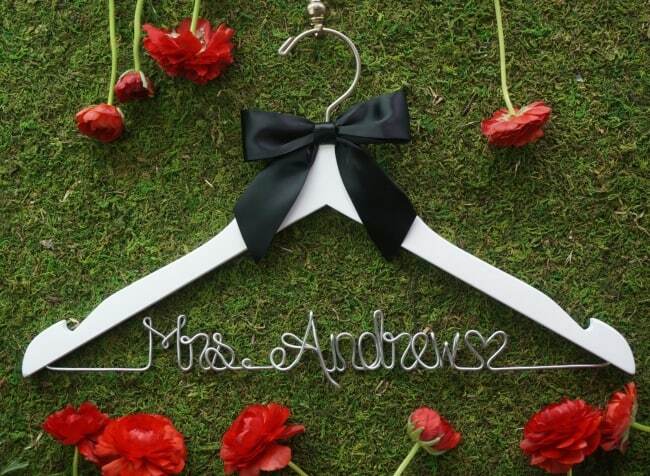 Your bridesmaids will be able to take their hanger home as a cute and practical memento, and having everyone’s name on their own hanger will definitely save any confusion on the big day. Wedding day rain is a source of stress for many brides, but don’t forget it is also good luck! If you are getting married during rainy season or in a climate that has a high probability of rain, give your ladies a cute Totes Dotted Bubble Umbrella to use on your wedding day. 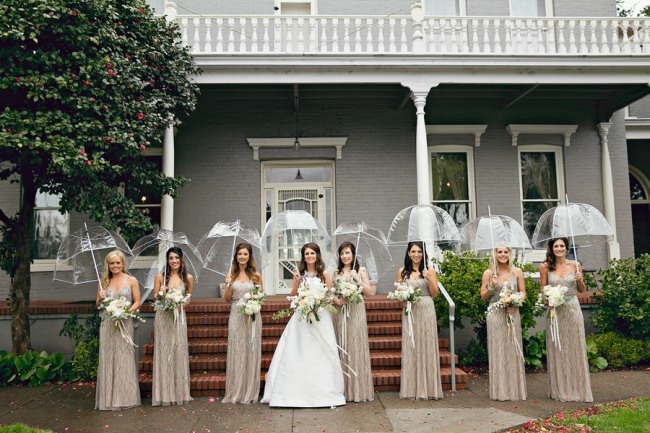 My advice to brides and bridesmaids: drink lots of water on the day of the wedding! A water bottle from S’wells is both fashionable and super functional. Made from BPA free double-walled stainless steel, this water bottle will keep your cold beverages chilled for 24 hours, and hot water going for 12 hours. With a vacuum seal that keeps carbonation and liquids fresh, and doesn’t leak or sweat either, which is doubly amazing and important for when you are all gussied up on the big day. Nobody wants big water splotches on their new dress before walking down the aisle. The water bottle comes in a number of beautiful designs, so everyone can have their own unique water bottle, making this a smart and functional bridesmaid gift. 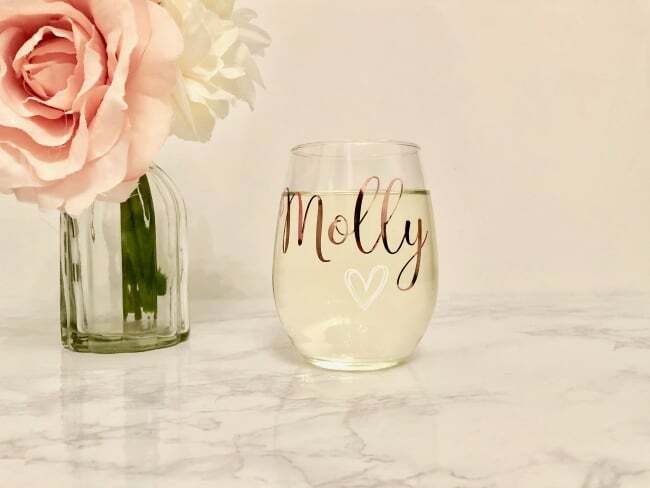 Who doesn’t love a personalized wine glass? Your besties will be able to keep an eye on their drinks all night long. Then once the wedding day is over, they can wind down after a long work week to enjoy a glass of their favorite wine in their custom glass. Tea? Coffee? Two sugars or one? I’m a coffee drinker and always love a cool mug design. 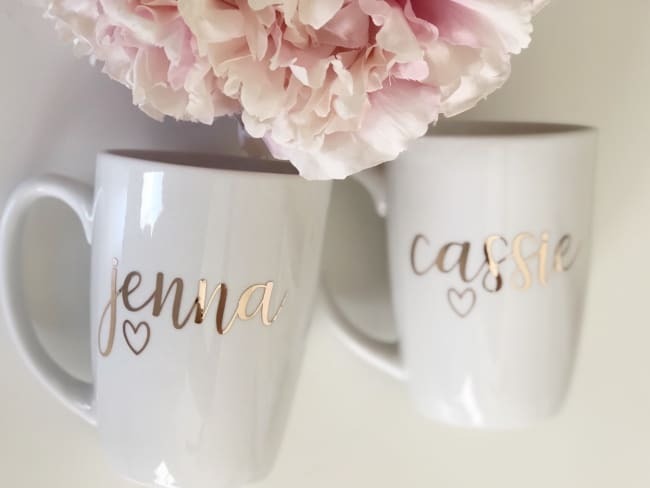 You cannot go wrong with this sweet Eye Lash or personalized girly mug. 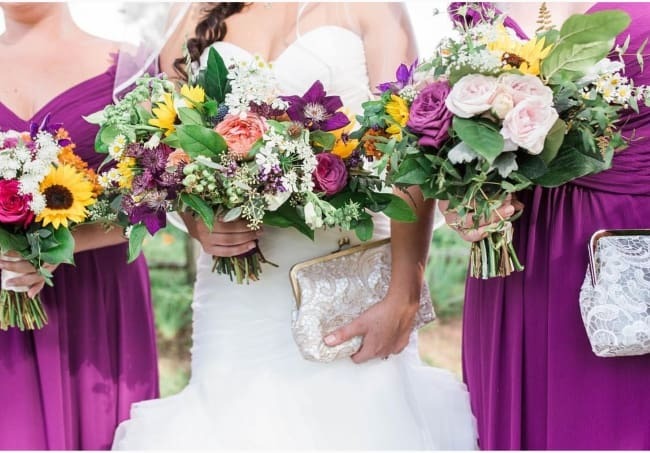 Maybe a little self serving as it will come in handy for the big day, but this cute bag is perfect long after the wedding day. 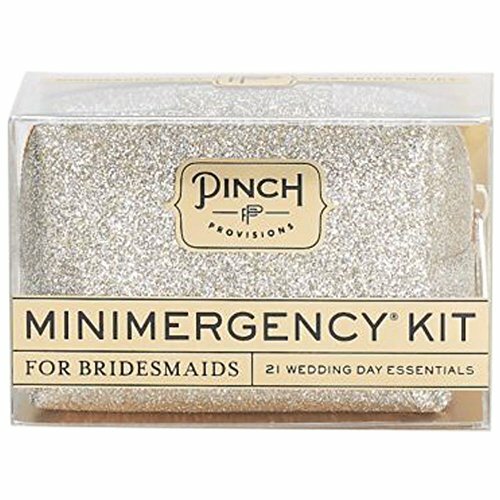 Get 21 wedding day essentials, or keep it in the car and you have everyday essentials for on the go. How many girl friends do you know that forever have their staple hair elastic around their wrist? If you’re anything like me, you know the annoyance of carrying the unsightly black elastic hair tie. Here is a fantastic solution, and one your bridesmaids will be grabbing for once they hit the dance floor. 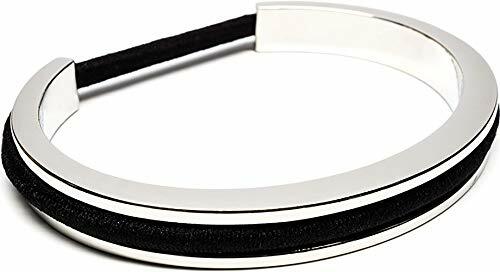 Gift them the awesome and innovative cuff bracelet that doubles as a hair tie holder. In fact, you may even want to gift this present to yourself too! If your friends have makeup collections that are even halfway as disorganized as mine, they’re going to love these cute monogrammed bags. 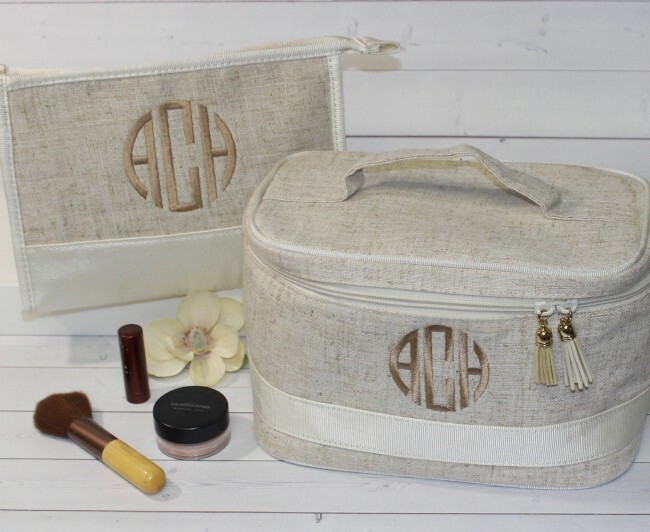 Holidays, weekends breaks, and even messy dressing tables can all have a mini-makeover with a makeup bag that marks your wedding day. This is a really sweet choice for those saying their vows by the sea or a wedding party staying at a resort with a hotel pool. It’ll also go down well if you and your gal pals travel a lot together. 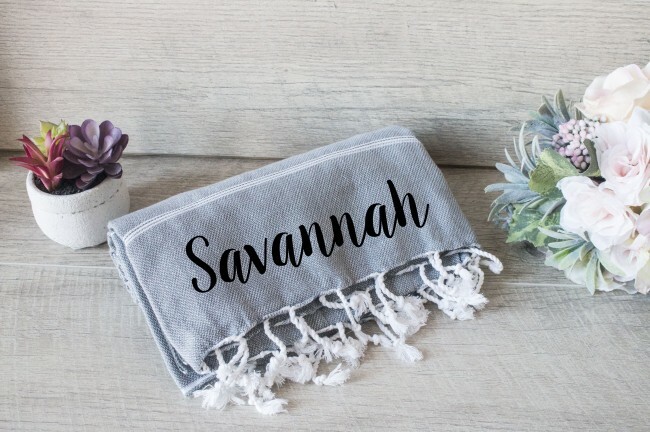 Use the personalized towels as a starting point for planning your next girly trip, post-wedding! What do you give ladies who love to travel? 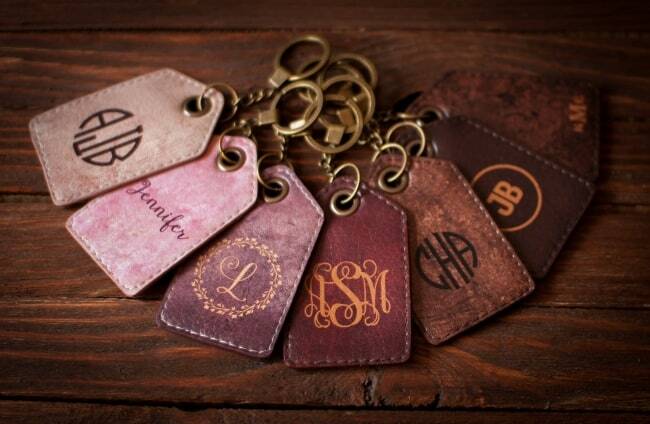 A gorgeous leather tag to help them keep an eye on their luggage as they’re hopping on and off flights. 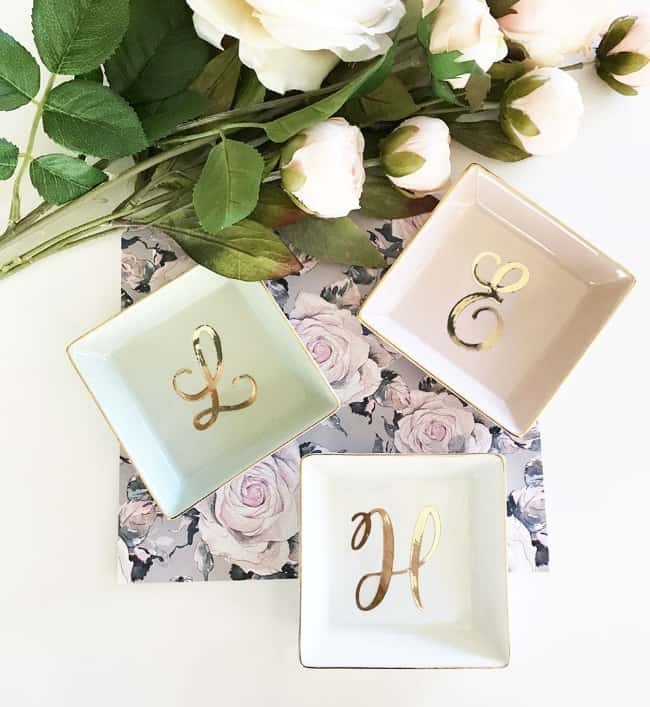 Have them monogrammed and choose your wedding colours for the background for a little memento that will make your girlies think of good times forever more. You can never have enough tote bags, right? I have a LOT of tote bags, I love them. They’re super handy for shopping and trips to the beach or gym. Everyone loves a classy version like this. 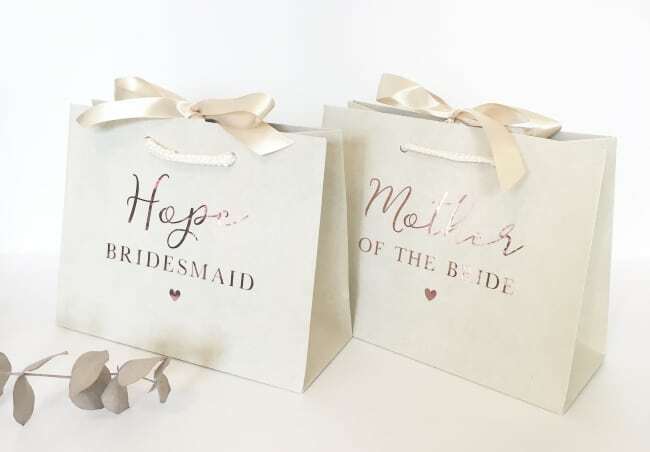 Skip slogans like bridesmaids or bride’s crew and have their individual names or initials put on the bags — a gift they’ll want to use again and again. Smaller gifts work too. What bridesmaid doesn’t love receiving a bright bottle of nail lacquer!? Mix and match different red and pink colors from Essie. Your bridesmaids deserve the chance to really chill out and unwind after your special day. 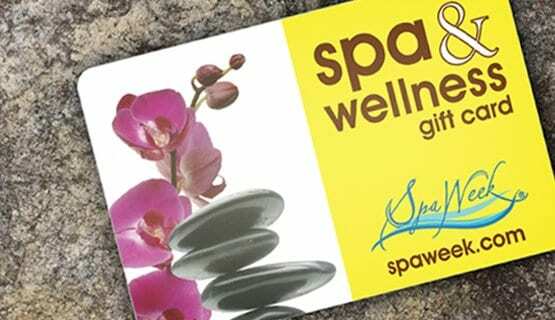 Why not spoil them with a gift certificate for a nearby spa? This can stretch to meet your budget – anything from a quick facial to a full massage and day by the pool. 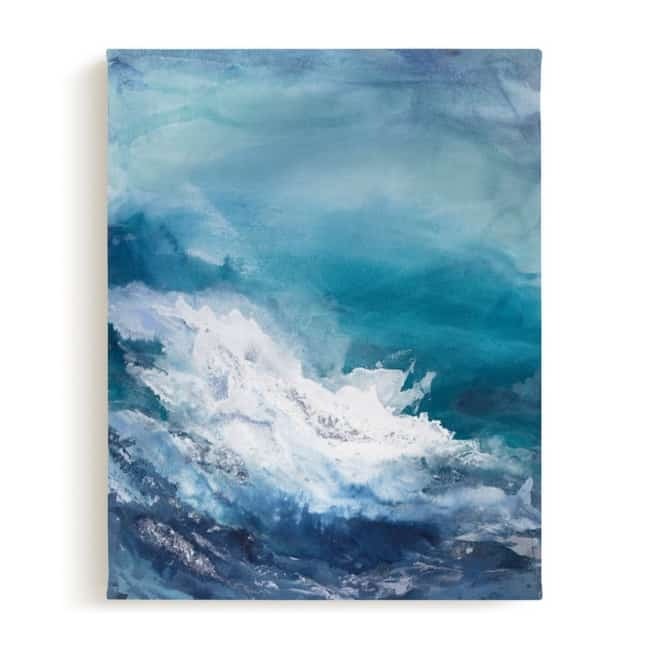 Give your ladies something extra special – pick out a limited edition piece of artwork they can hang on their walls. 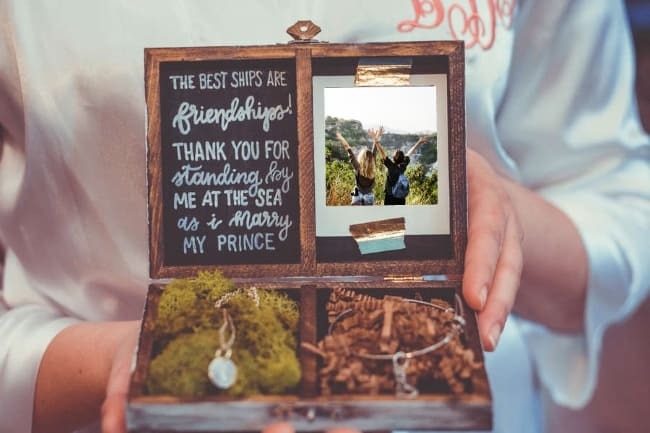 You could commission a unique print that symbolizes your friendship, or there’s the beautiful option of framing a custom poem or quote. Here’s the one gift add-on that you have our permission to cover in slogans and wedding chat! 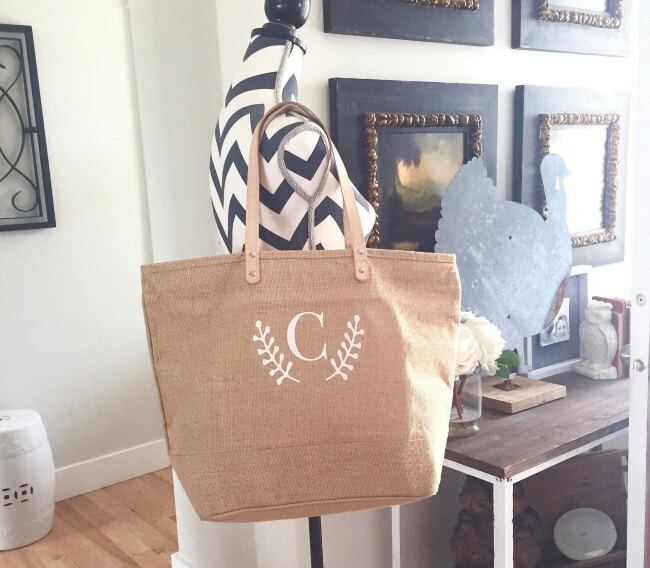 Pop whatever gifts you choose into an adorable, personalized gift bag and make it as wedding-branded as you like. Inspired to buy your bridesmaids something that they will love and use for many occasions to come? When your best girl friends say yes to taking on the roll of a bridesmaids (especially Maid of Honor), they are putting a lot of time and effort to make sure your big day will be perfect. Make sure you take time to get them something meaningful and long lasting. Need to find out what else you need to buy for your wedding day? 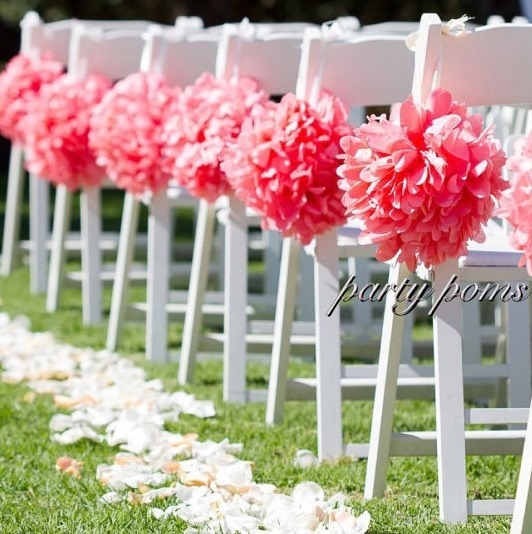 Check out our The Ultimate List of Things to Buy For Your Wedding post to find out!